General Description of Recombinant Canine Leptin. Leptin Dog Recombinant produced in E. Coli is a single, non-glycosylated, polypeptide chain containing 146 amino acids and having a molecular mass of 16 kDa. The Leptin is purified by using an optimized multi-step FPLC method for maximum separation from contaminants. Host: QP10754 protein expressed in E. Coli. Protein Construction: A cDNA sequence encoding the sequence of Leptin was constructred and used to recombinantly synthesize the protein. Recommended Reconstitution Instructions: It is recommended to reconstitute the lyophilized Leptin in sterile 0.4% NaHCO3 adjusted, not less than 100µg/ml, which can then be further diluted to other aqueous solutions. 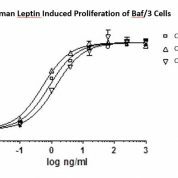 Bioactivity Data: Biological active as evidenced by inducing proliferation of BAF/3 cells stably transfected with the long form of human leptin receptor. Concentration of Canine Leptin Protein: Protein quantitation was carried out by two independent methods:1. 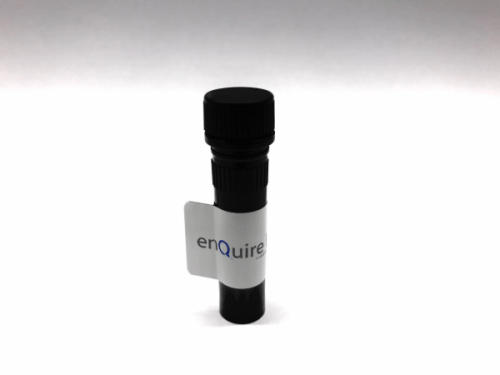 UV spectroscopy at 280 nm using the absorbency value of 0.20 as the extinction coefficient for a 0.1% (1 mg/ml) solution. This value is calculated by the PC GENE computer analysis program of protein sequences (IntelliGenetics). 2. 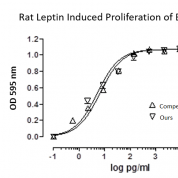 Analysis by RP-HPLC,using calibrated solution of Leptin Dog as a Reference Standard. Storage Conditions: Lyophilized Leptin although stable at room temperature for 3 weeks, should be stored desiccated below -18°C. Upon reconstitution Leptin should be stored at 4°C between 2-7 days and for future use below -18°C. For long term storage it is recommended to add a carrier protein (0.1% HSA or BSA). Please prevent freeze-thaw cycles.